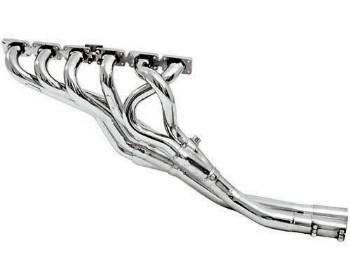 At VAC we have made tremendous power gains with the Supersprint products, especially their headers! Buy with confidence knowing your investing in a product that gets results, and fits properly. The engineers at Supersprint realize that for maximum performance, exhaust development must begin at the exhaust ports of the cylinder head. This is why Supersprint has the largest variety of racing header systems in the world today. Each header incorporates CNC laser cut port matched flanges. Primary tubes are mandrel bent using the latest CNC tube bending equipment. With special tooling Supersprint has been able to keep weld joints to a minimum for added reliability. The fully appointed R&D department uses the latest in proto typing equipment along with the reliability and accuracy of a MAHA "all wheel drive" chassis dyno. With over 50 years in performance exhaust development they have earned the confidence of many of Europe's most respected tuners. Check out professional BMW race cars; many use Supersprint!